For the first time, collectors and philanthropists Gene and Brian Sherman are selling part of their vast art collection, placing 16 works by Australian modern and contemporary artists into auction with Deutscher and Hackett in Sydney on August 26. 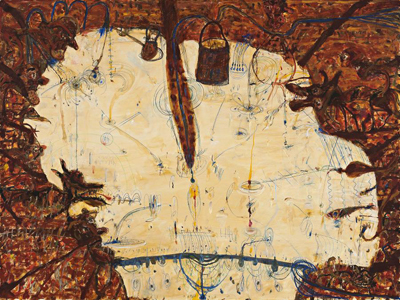 "... As for this first toe in the water, the key lot is expected to be John Olsen's large oil painting Water Flowing into Lake Eyre from 1992. It has been given an estimate of $250,000 to $350,000. In April, a large Olsen painting from 1973, Captain Dobbin, made $402,600 including a 22 per cent buyer's premium in Sotheby's sale of the David Clarke collection. Tim Storrier's three metre wide painting the Cacophony of Wisdom (An Economy of Dust and Ashes) from 2003 is expected to go for between $150,000 and $200,000. Part of the proceeds will be donated to the National Art School. As a former academic – Sherman taught French language and literature for 17 years prior to opening Sherman Galleries – she is passionate about liberal arts education. NAS is one of a number of tertiary institutions that the Shermans have supported, either as philanthropists or on councils."